St Mary's Stadium where Southampton will host Stoke City today. ALL PREMIER LEAGUE games scheduled for Saturday will go ahead today, however six games due to be played in the Championship have been postponed. Adverse weather conditions across the UK has meant games including league leaders Wolves and promotion hopefuls Aston Villa will not go ahead. 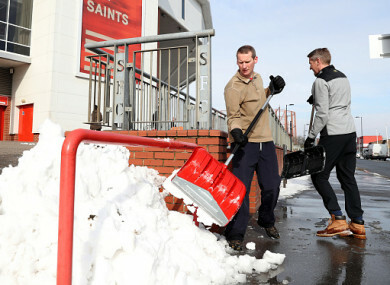 Snowy conditions continued into Saturday, meaning Barnsley’s game at home to Norwich, Brentford versus Cardiff City, Sheffield United against Burton Albion and Wolves against Reading, as well as Aston Villa versus QPR and Ipswich against Hull have all been postponed. A large number of matches across both League One and League Two have also been called off. While all four Scottish Cup quarter-finals have been given the green light to go ahead, all other Scottish Premiership games have also been cancelled. Email “All of Saturday's Premier League games to go ahead but six Championship matches called off”. Feedback on “All of Saturday's Premier League games to go ahead but six Championship matches called off”.